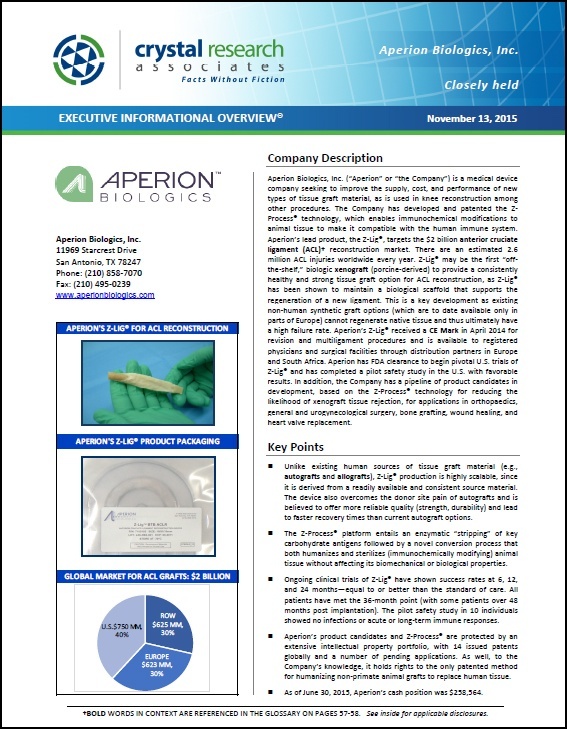 New Research Released on Aperion Biologics, Inc.
An Executive Informational Overview (EIO) is now available on the medical device company Aperion Biologics, Inc. The EIO released Friday is a 60-page report detailing Aperion's business, technology and product development, market opportunities, competition, financials, risks, and more. It is available for download below. Mega Mergers in Big Pharma: What's driving them? In just six months, drug companies have spent $221 billion buying each other, with a lot of recent mergers being between biotech firms. So what is driving the deals? Business television show Arise Xchange sits down with Jeff Kraws, Cofounder and CEO of Crystal Research Associates, to discuss.